Atop Gellert Hill on the Buda side is one of the most impressive monuments in all of Budapest, The Citadel. Standing as a UNESCO World Heritage sight in Budapest, The Citadel is a symbolic part of Hungarian military history. Citadel, also known as Citadella, is a Hungarian word for fortress. 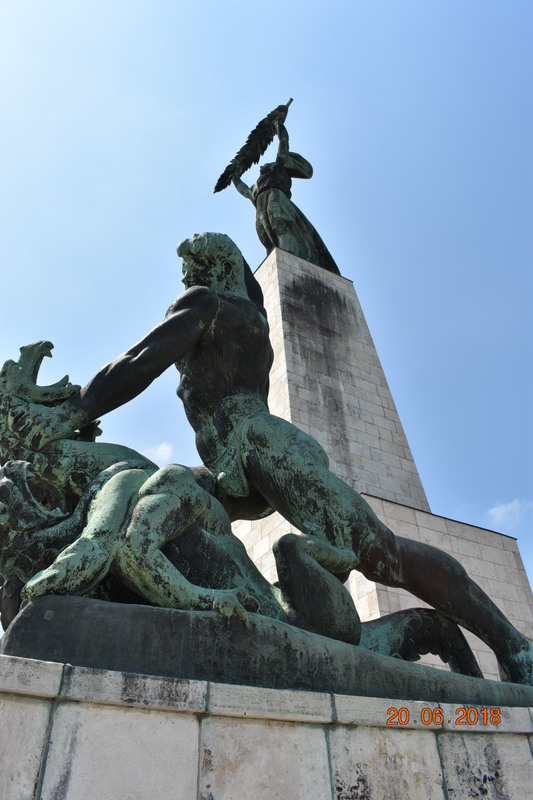 It was built in the 1840’s after the Revolution as a stark reminder and intimidation to Hungarians. However, today it stands as a symbol of freedom for Hungry, especially with the iconic “statue of liberty”. On Wednesday, I wanted to see the site in person rather than view it from the ground on the Pest side. I had heard there were a few options to reach it including a paid tour, a public transport bus or the preferred way, by foot. I opted for the “by foot” route and started my journey near the famous Gellert Hotel. At first, you see steps and steep pathways but it is a little confusing which direction to go. Eventually, I figured it out and started to identify small markers confirming I was on the right track (see photo below). The climb can be steep but all in all, it took me no more than 20-25 minutes. I chose to stop along the way at some of the vantage points which provided some stunning views of the city. As my last few steps appeared, I ascended to the top and was immediately amazed at what I saw. To my surprise, the area atop Gellert Hill is significantly larger than I expected. From a distance, you can only see the Statue of Liberty (pictured above) as it rises high above the hills. It is visible from many parts of Budapest. However, once you have ascended to the top, you find a sizable area that was once a fortress as well. Given it no longer serves as a fortress, it is now a part of history that is a must see in Budapest. It has also become a bit of a “commercial” spot as well where you can find souvenirs, an area to practice archery, food and drink stands and more. I must say I was really happy to find water when I made it to the top! I roamed the area a bit and took some great photos of the city, looking south and north and enjoying the vantage point from this part of the city. I eventually descended and went back home only to read up on the history of The Citadel. I found that not only was this an important piece of Hungarian history, it was also a symbol of the politically fraught past of Hungary. In 2017, it marked its 70th birthday as a feature of Budapest, installed originally by the Soviets in order to pay tribute to the Red Army’s triumph during WWII. Much like many historic sites throughout the world, it is natural to go see The Citadel, take photos and think about how cool it is that you are able to see it in person. However, my post-research on its meaning and history reminded me that some of the most beautiful sites in the world have dark beginnings. Fortunately for The Citadel, its liberation as a surviving monument now makes it a sign of freedom, while still reminding us of the not so distant past. i cannot wait to climb to the top and have enjoyed reading this informative article. you explain each site you visit wonderfully.